Half-round gutters are fast becoming a preference among homeowners in San Antonio because they not only get the job done when it comes to dealing with rain water, their unique and elegant design adds to the look and feel of a home. There is no doubt that top quality gutters can help you keep your home in top condition, preventing your home’s foundation and also your lawn from erosion. 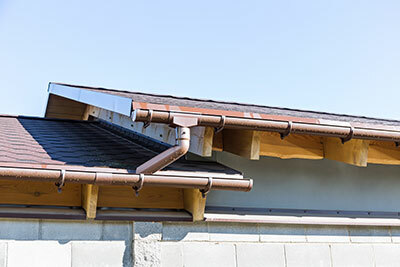 With an effective rain gutter system in place, you can rest assured the rain water will be drained away from your home, ensuring no damage is caused by seepage or leakage. As the name suggests, half-round gutters have a semi-circular shape, which is the main factor of their unique appearance. San Antonio Rain Gutter Pros is your one-stop shop when it comes to all things half-round gutters. From helping you select the right gutters which go well with the exterior of your home to installation, from repair and maintenance to replacement, we do it all for you. If you are interested in getting high-quality half-round gutters installed around your home, now is the time to get in touch with us to ensure that by the time rain comes, your home is protected against rain water damage. We will not only install the gutters properly but also prepare a patch on the ground using mulch or gravel. Using this type of material prevents soil erosion, keeping your home’s foundation and lawn in top shape. You can be confident about half-round gutters as in our experience, they always serve their purpose. The only catch is that the gutters should be installed properly, which is where we come in. our team of rain gutter installation professionals ensure the gutters are in place perfectly and are up for the task of protecting your home from rain water. It is our aim to install half-round gutters with perfection, to ensure they last and perform their purpose for years to come. We use the right tools and equipment for getting the job done, which also guarantees durability and reliability. We also install an adequate number of hangers to keep the gutters in place, to prevent any risk of damage. All this is done with the utmost care and skill, preventing damage to your roof. This way, you can rest assured your rain gutters will continue serving you for the extent of their useful life. Not to mention, with our expertise, you can rest assured the rain gutters will add to the style and visual appeal of your home. You can bank on our experts to select the right half-round gutters for your home, so that you get the best of both: protection and visual appeal. We pride ourselves on providing a complete range of half-round gutter services for homeowners in San Antonio. Schedule an appointment with us today and we will provide you an estimate. From the installation to maintenance, we can take care of your half-round gutters so you get the best of them. Call San Antonio Rain Gutter Pros now!